Room 5: Buzzing Bees in Room 5. Buzzing Bees in Room 5. 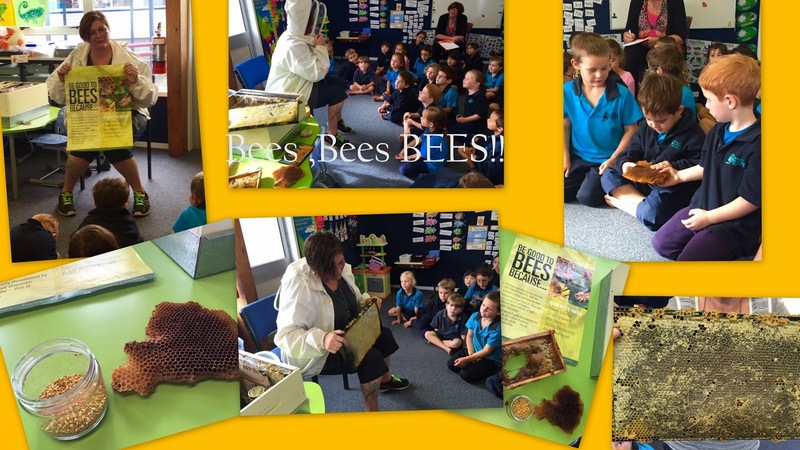 Last Friday we were lucky enough to have Christine - an apiarist, come and talk to Room 5 and 6 about bees. We have started our unit on bees and were very excited to learn more interesting facts. Christine brought in some frames from a beehive to look at, and the best part was, these frames had honey! We were allowed to take turns and poke our finger into the comb and taste the honey! Did you know that the girl bees do all the work? And in winter , the boy bees get kicked out of the hive? We can't wait to learn more about bees and how they work, stay tuned to learn more fun bee facts! Check out the photos below of our visit from Christine. Room 5 performs at assembly. Happy Mothers Day to the mums of Room 5. Go Noodle in Room 5!